Hake is a really versatile white fish. It has a meaty texture that holds together when cooked and is also really good value as it’s not as popular as cod, haddock etc. It’s quite mild and so goes well with firm flavours like the mushrooms and sage below. Bring the stock and wine to boil in a small pan. Simmer rapidly until you have just 2 tbsp of liquid left. Stir in the cream, take off the heat and set aside. Heat the butter and oil in a frying pan and toast the hazelnuts until golden, coarsely chop and then set aside. Next, crisp the sage leaves in the same pan for just a few seconds, then drain them on kitchen paper. Fry the mushrooms until soft, you will need a little more butter. Season, then tip them onto a plate. Cook the hake in the same pan for 2-3 minutes on each side. Reheat the sauce over a low heat. 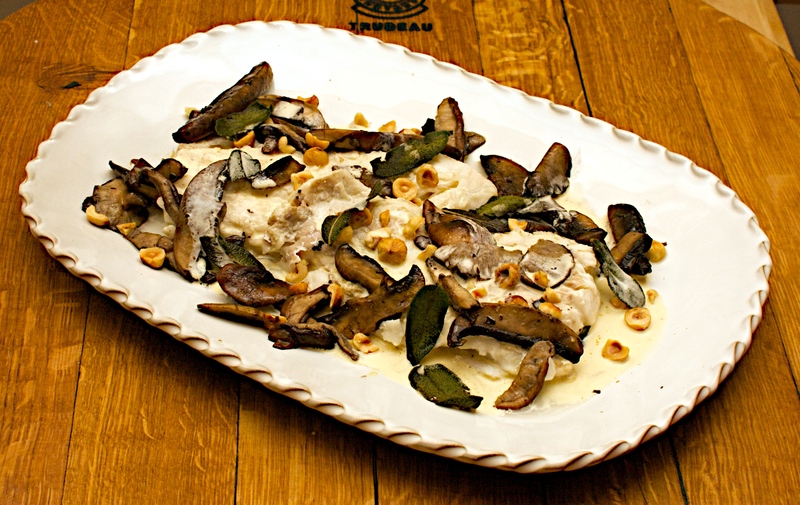 Put the cooked fish onto warm plates, pour a little sauce over each and scatter over mushrooms, hazelnuts and sage. Wine Suggestion: Something like a Vermentino from Italy or Sardinia that has a little more body – 13% abv or more (as some are a lighter style – 11-12% abv – which would be overwhelmed with these flavours). This should be nutty and minerally and will complement the earthy flavours in the dish. That looks delicious! Love the mushrooms. Fantastic. This is right up my street! Definitely making it in the next few weeks. Thanks for the recipe!